What is HPTN 071 (PopART)? HPTN 071 – Population Effects of Antiretroviral Therapy to Reduce HIV Transmission (PopART) is a research study that examined the impact of a package of HIV prevention interventions on community-level HIV incidence. The prevention interventions included universal voluntary HIV counseling and testing provided at household level, linkage of HIV infected individuals to care and early initiation of antiretroviral therapy (ART) for all those testing HIV-positive. The study was conducted in 21 communities in the Western Cape of South Africa, and in Zambia. 21 urban and peri-urban communities in Zambia and South Africa, with a total population of around 1 million, participated in this study. To measure the impact of the intervention, a research cohort called the Population Cohort, consisting of a sample of approximately 2,300 adults aged 18–44 years, was recruited from the general population of each of the 21 communities (an overall total of 48,302 across all communities) and was followed up once a year for three years to measure HIV incidence and other outcomes. Why did the HPTN conduct this study? HIV incidence rates remain at very high levels in many parts of southern Africa. There is an urgent need for more effective HIV prevention strategies. Currently there are still nearly 2 million new HIV infections every year. More effective prevention strategies are needed to steeply reduce the number of new HIV infections and to ensure that care can be provided for all people living with HIV. Findings from HPTN 071 (PopART) will help inform the scale-up of future HIV programs and identify cost-effective interventions. In total 21 communities participated in the HPTN071 (PopART) trial. 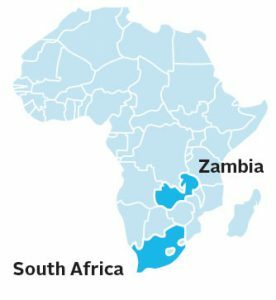 In Zambia, 12 communities participated in the study. The 12 communities were divided into four matched “triplets” of three communities each. The triplets were composed of communities that had been matched so all three had similar estimated HIV prevalence, to minimize the variability in baseline HIV incidence within the triplet. Then each community in the triplet was randomly assigned to one of three study arms: A, B or C. The same process was repeated for the nine communities in South Africa for a total of 21 communities, with seven communities in each arm. Arm A received the full PopART HIV combination prevention package including the offer of immediate ART, Arm B received the PopART package, but with ART only offered to those eligible according to national guidelines, and Arm C communities had no household intervention but could access HIV testing and treatment services according to the local standard of care. What was the PopART intervention in Arms A and B? Offering voluntary HIV counseling and testing annually through a house-to-house campaign. Linking those with HIV to care at the local health center. Follow-up visits to HIV-positive clients to ensure they had linked to care and to support retention and ART adherence. Promoting voluntary medical male circumcision for men who tested HIV-negative. Promoting services for the prevention of mother-to-child transmission (PMTCT) to HIV-infected pregnant women. Referring for treatment of sexually transmitted infections. Providing condoms in the community. Screening and referral for tuberculosis (TB). HIV care and ART were provided at the local government clinic serving that community. In Arm A, all HIV-positive patients were offered ART irrespective of CD4 count or clinical stage. In Arm B, ART was initiated according to local guidelines. Initially this was at a CD4 count of 350, then later this changed to 500, and in 2016, following a change in WHO recommendations, ART was offered to all HIV-positive patients as in Arm A. What were the study objectives? The primary study outcome was HIV incidence between month 12 and month 36 amongst members of the Population Cohort who were HIV-negative at baseline, comparing HIV incidence across the three study arms (A, vs C and B vs C). This allowed the effectiveness of the PopART intervention at population level to be measured. HIV incidence during each year of follow-up. HIV disease progression and death. How does HPTN 071 (PopART) differ from other trials of Universal Testing and Treatment (UTT)? Three other trials were conducted in Southern Africa to investigate the impact of UTT on HIV incidence, at approximately the same time as HTPN 071 (PopART). ANRS 1229/TasP (Treatment as Prevention) was a 2 arm community-randomized trial undertaken in rural communities in KwaZulu Natal in South Africa between X – Y dates. The TasP intervention included visits to every household to offer HIV testing within both control and intervention communities, and HIV-positive clients were referred to a specially provided ART clinic in each community which provided universal ART in the intervention arm or ART according to local guidelines in the control arm. The TasP trial reported in 2016 and showed no difference in HIV incidence between the intervention and control communities. The explanation appeared to be poor linkage to care, with similar low coverage of ART in both study arms. The Sustainable East Africa Research in Community Health (SEARCH) study, was a 2 arm community-randomized trial in rural communities in Uganda and Kenya. The SEARCH intervention provided HIV-related services through periodic community health campaigns where HIV was just one of the diseases for which prevention and treatment were provided. The intervention communities had regular intensive HIV and health campaigns whilst the control communities had a baseline and end-of-study campaign only. The primary result of the SEARCH trial based on testing from attendees at the campaigns demonstrated no significant difference between the two study arms in HIV incidence, although the health campaigns were very well accepted and dramatically improved knowledge of HIV status and ART coverage in both study arms. The Botswana Combination Prevention Project (BCPP) (also known as Ya Tsie) was a 2 arm community-randomized trial undertaken in rural communities in Botswana. The design of this study was the closest to HPTN 071 (PopART), focusing on service provision to all community residents at the household (with treatment provided at local government clinics) compared with a, standard of care arm where no household intervention was offered. The Ya-Tsie study showed a reduction in HIV incidence of 30% in the intervention compared with the control communities, but this was of borderline statistical significance. Although both studies measured incidence by following a cohort of adults for annual HIV testing, the BCPP study included adults to 64 years and as young as 16, whereas HPTN 071 (PopART) was aged 18 to 44. In addition, multiple adults in the same household could be followed in BCPP whereas in HPTN 071 (PopART) each randomly-selected member of the cohort was drawn from a different household. How did HPTN 071 (PopART) differ from the other UTT trials? HIV incidence was measured in a separately recruited population cohort in PopART and Ya Tsie whilst in TasP and SEARCH incidence was measured through the intervention. c) In PopART and Ya Tsie, the control communities did not receive any additional intervention outside of current standard care whilst in SEARCH and TasP the control communities received enhanced community-wide HIV services, particularly for HIV testing and linkage to care, probably explaining the lack of observed difference between the intervention and control arms. What were the key findings from HPTN 071 (PopART) study? Findings from HPTN 071 (PopART) show delivery of an HIV prevention strategy that includes offering HIV testing to everyone, with immediate referral to HIV care, and treatment for people living with HIV based on prevailing in-country guidelines, can substantially reduce new HIV infections. In the study arm where the PopART intervention included HIV treatment according to in-country guidelines (Arm B), HIV incidence declined by 30 percent compared to standard of care communities (Arm C), an improvement that was highly statistically significant. In both intervention arms (A and B), the first two of the UNAIDS 90-90-90 targets (regarding knowledge of HIV status and being on treatment) were reached and high rates of viral suppression were achieved. In the study arm where the PopART intervention included the offer of universal ART even before it was national policy (Arm A), incidence only declined by seven percent compared to the standard-of-care arm, and this was not statistically significant. The lack of a clear effect in Arm A was surprising, and not explained by observed rates of viral load suppression. Further analyses underway may help explain this finding. These results, clarified by further analysis and in conjunction with those from other universal test and treat trials, will help guide policymakers on how best to leverage community-based HIV testing and linkage to care to achieve HIV control. What additional HPTN 071 study analysis are underway? HPTN 071 researchers are currently examining the effects of the interventions on other study outcomes including herpes simplex virus -2 (HSV-2) incidence, tuberculosis and HIV-related stigma. Work is also in progress to estimate the cost-effectiveness of the interventions. Who were part of the HPTN 071 study team? The study was conducted by the NIH-funded HIV Prevention Trials Network (HPTN). The study was led by investigators at the London School of Hygiene and Tropical Medicine (LSHTM) in collaboration with Imperial College London, the University of Oxford, the Zambia AIDS Related Tuberculosis (ZAMBART) Project and the Desmond Tutu TB Centre (DTTC) at Stellenbosch University, South Africa. Who were the study funders? The study was sponsored by the National Institute of Allergy and Infectious Diseases (NIAID) with funding from the U.S. President’s Emergency Plan for AIDS Relief (PEPFAR). Additional funding was provided by the International Initiative for Impact Evaluation (3ie) with support from the Bill & Melinda Gates Foundation, as well as by NIAID, the National Institute on Drug Abuse (NIDA) and the National Institute of Mental Health (NIMH), all part of NIH.